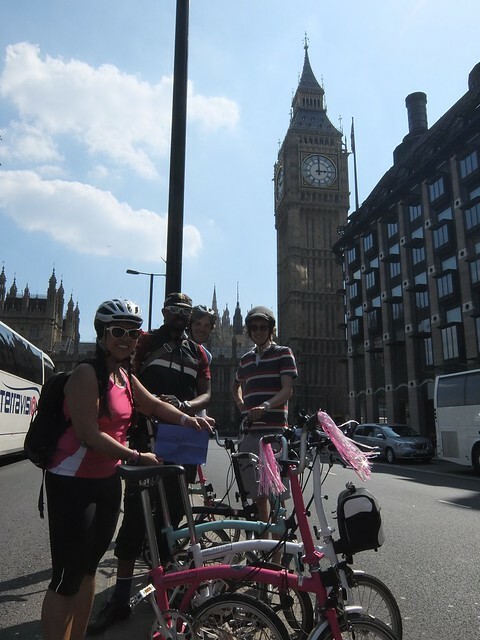 This past Sunday saw me take part in the Brompton Urban Challenge. 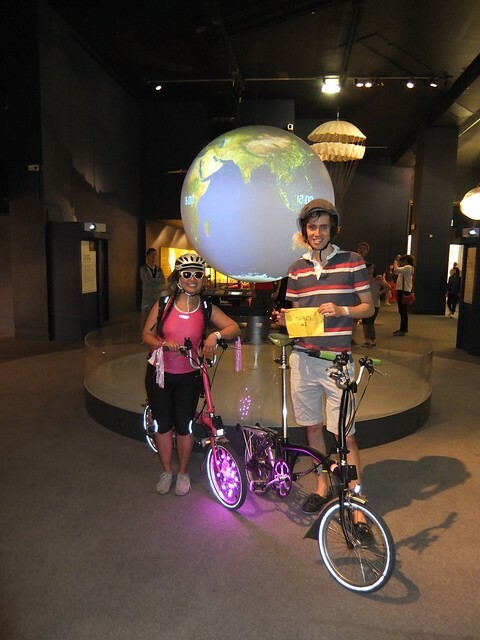 This can be best described as a Brompton treasure hunt around London, riding around, following the clues give at each checkpoint to get to the next checkpoint whilst carrying out challenges along the way. 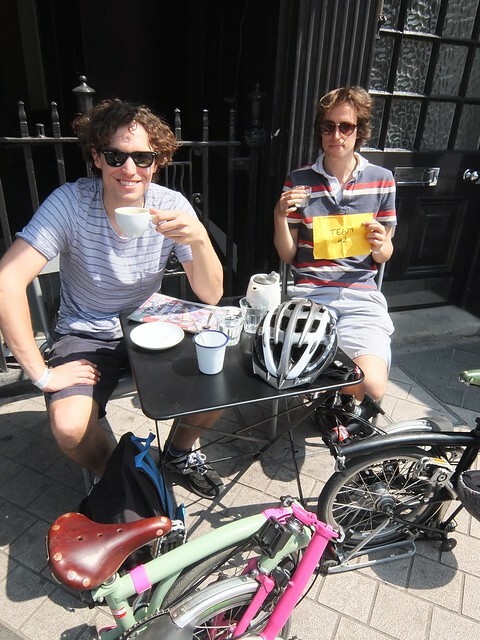 I’d done a similar type of ride during my time at Loughborough University where I’d taken part in a mountain biking treasure hunt and managed to come third (much to the disgust of the organiser, my housemate, due to the fact I cycled a hybrid and mainly cycled between the parts on the road!) So I was really looking forward to it, especially as this time it was in a team, rather than an individual event. The weather promised to be fantastic so I made sure I packed some sun cream and headed out for the day. Quick stop at Kings across on my way in for a bacon bap to get the day off to a good start. Whilst eating, I watched two guys, far worse for wear after the Arsenal game the day before, make fools of themselves and then argue and proceed to get arrested by a member of the British Transport Police. An interesting start to e morning but typical of London - it wasn’t even half past 9 yet! They say London never sleeps! 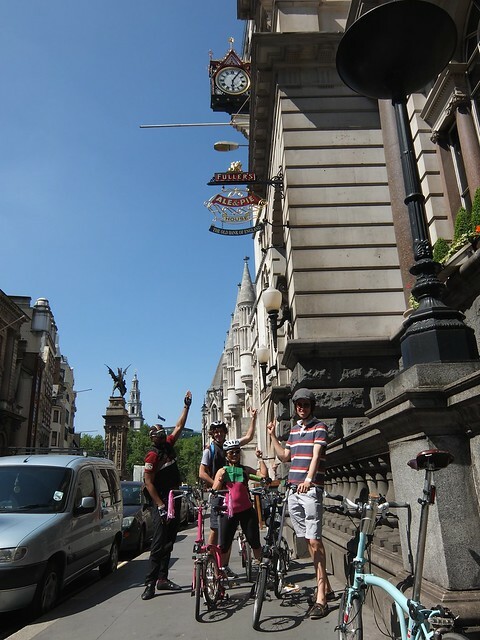 Cycling over to Covent Garden I was impressed with how well I was getting to know London (a lot more now that I’d got the Brompton) how much I was enjoying my time here - five or six years ago when I was studying in Leeds, I hated London and could barely stomach a day trip here. Now I’m about to buy a house just outside London and spend at least five days a week here! 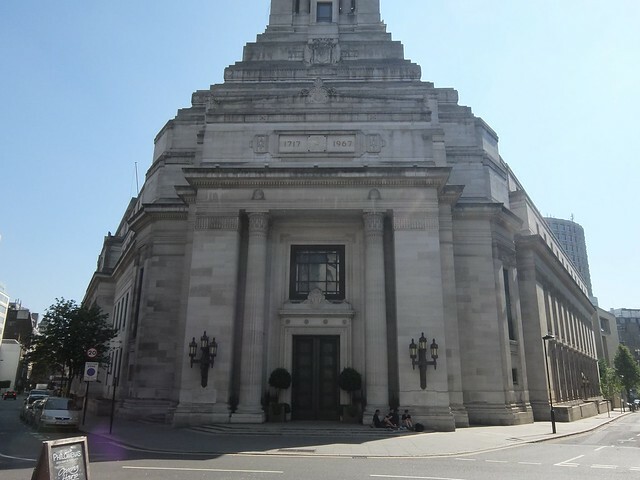 I met with team early enough (by the Grand Lodge of the Mason’s - an impressive building) - too early perhaps as didn’t start until 11, so we were left to analyse our first clues and get ourselves ready to go. The challenges were interesting and relied on photography, something I’d known when I signed up. Having sold my iPhone a few weeks previously and moved to an Android phone, with a pretty poor camera, I decided that I’d invest in an Eye Fi card for my digital camera that would let me take pictures on the decent camera and then send the. To my phone for submission via Twitter. I hoped that this would work, as it meant that I could take pictures all day on a decent camera and not have to swap and change between my phone and camera (as, you might know, I want to take more pictures this year.) I seemed to be duly elected as the camera man for the team so we waited for the word go. First trip was to the Brooks store opened in Covent Garden. Brompton and Brooks obviously have a close relationship, as I can imagine their shock if we’d all turned up for photos in the store without having been pre-warned! I’d been into the store that week to purchase a Brooks saddle for my bike (post to come soon) so I knew where it was and what I was expecting - somehow I led the pack there and was the first to arrive. Getting a quick picture outside, we headed in to grab a picture with the picture of the Brooks owner himself. 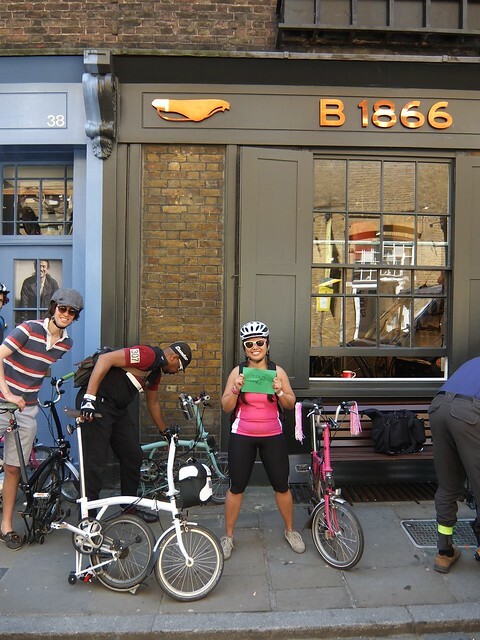 With that completed, we headed into Covent Garden where we attempted to replicate the Oscar’s selfie with a group of tourists on a bike tour of London (normal bikes unfortunately, not Bromptons but you can’t have everything!) However, I’ve not got that image. 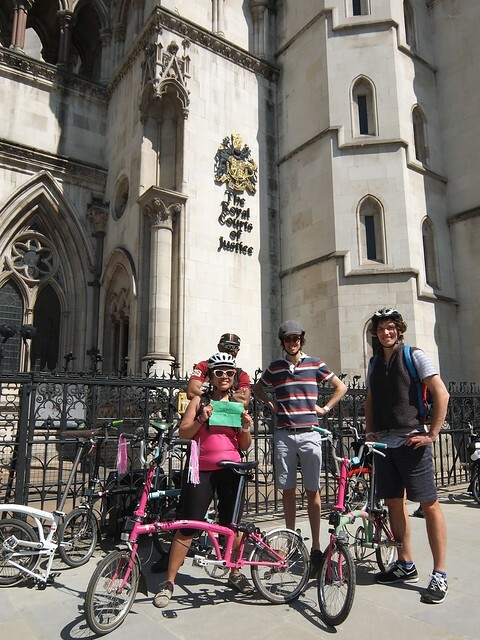 We then proceeded to head to the Royal Courts of Justice to get a photo. I think perhaps we focused a bit to much on making sure that we got all the images and tasks completed, rather than perhaps interesting and dynamic poses which categorised the winning team. However, we still had fun, and I guess that was the aim! 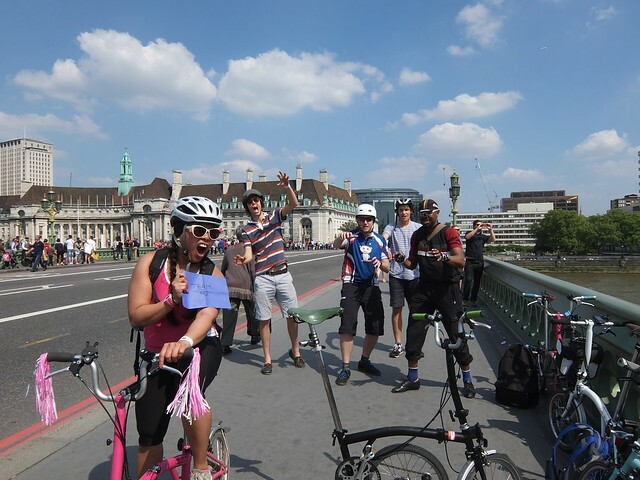 It was on the way to London Bridge, to get to our first checkpoint and next set of challenges, that we ran into some issues. Heading down Fleet Street, one of our team mates ended up taking a spill to avoid a BMW driver who decided that box junctions, right of way and cyclists aren’t high is his or her highway code. No one thought to get the number of the car as we were busy helping Chris up and as soon as we helped her off the road, the driver sped off. Thankfully, Chris wasn’t to hurt and a motor biker that had seen it all happen got off and provided us with some plasters and tissue. A little shaken, (but never stirred - apt, considering the 007 number she had for the day! ), we carried on. 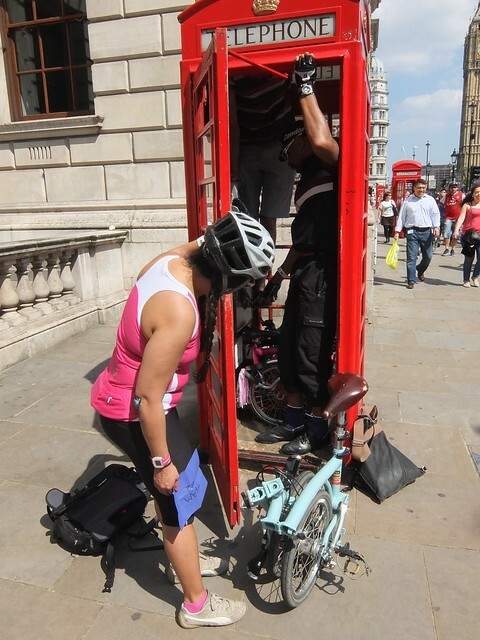 Just a good indication that even on Sunday’s, London can be a tricky place for cyclists. 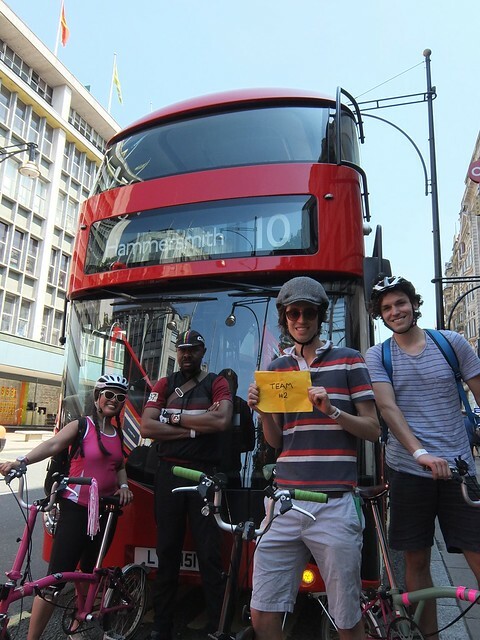 Towards the end of Oxford Circus, we stopped to grab a photo with a Routemaster. 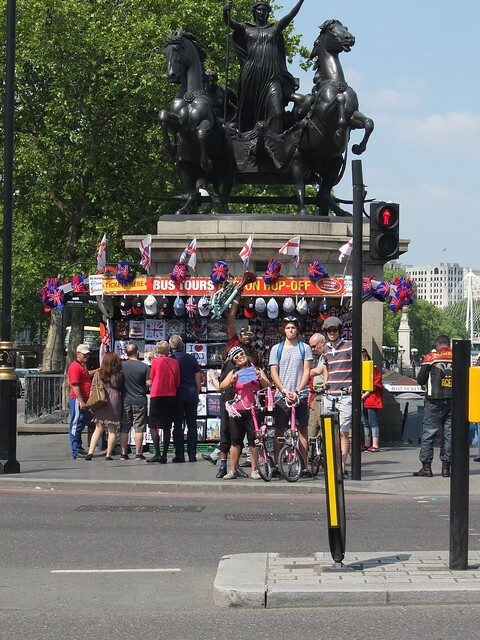 We cycled through Hyde Park (this time, I wasn’t threatened with a fine for cycling not on the cycle path - that was two years ago during the Olympics, was my first weekend in London and the first time I’d ever cycled in London… I’ve learnt my lesson!) and headed to the Science Museum. 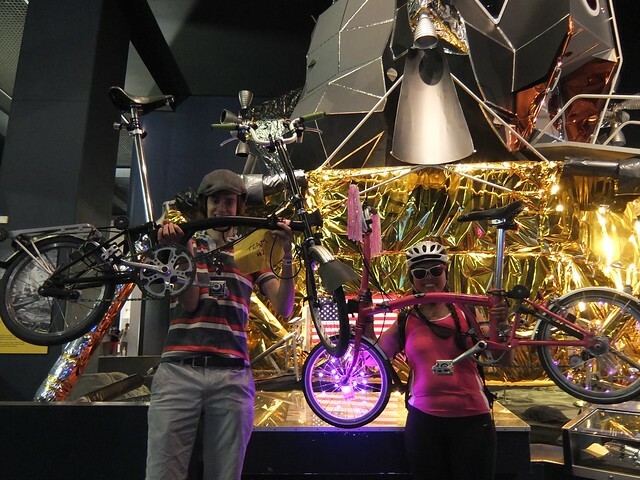 We needed a picture of a Brompton “in space” and I’d thought the Science Museum was a great idea (however, we weren’t the only ones to think that!). It’s a really nice area around there and perhaps an area I’ll be spending some more time around if certain things work out. 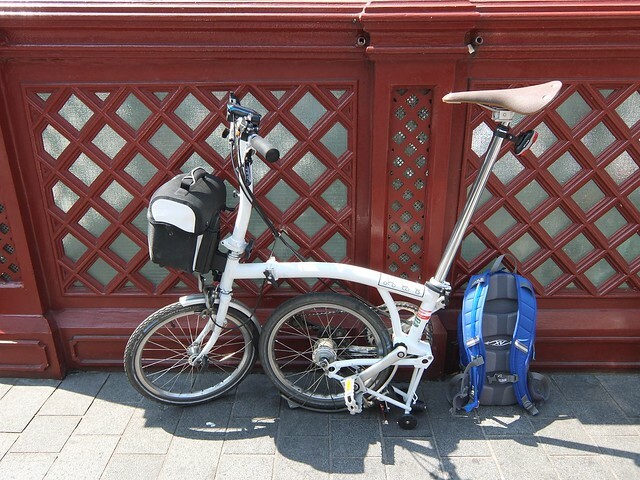 We stopped for lunch (kindly provided by Brompton, which whilst nice, included a glass bottle - I drank mine before leaving Brompton Junction as I wasn’t going to carry a glass bottle around with me on London streets if it could be avoided). Pausing to get a cup of tea, we powered onwards. 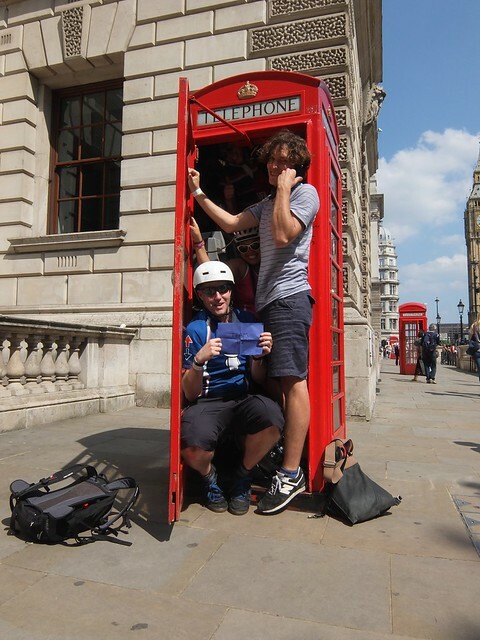 Thats five of us in the phone box, with three Bromptons (though they are kind of hidden at the back). We then got our picture with Boadicea. Terrible photography meaning I’d cut the head off… Without a manual viewfinder and not being able to see the screen in the sunlight, it can make for some poor surprises later on it seems. Three O’Clock and we managed to get out pictures with a famous clock… considering we were in the area, there was only one famous clock we could have really used…. 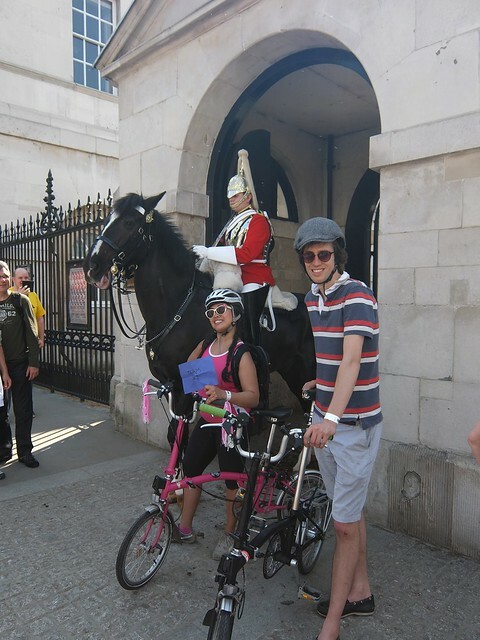 The final challenge before heading back was to get a picture of someone in uniform with the Bromptons. It was a shame as we’d just missed the changing of the guards when this took place. Anyhow, a quick trip back up the Strand to Covent Garden to complete the challenge. 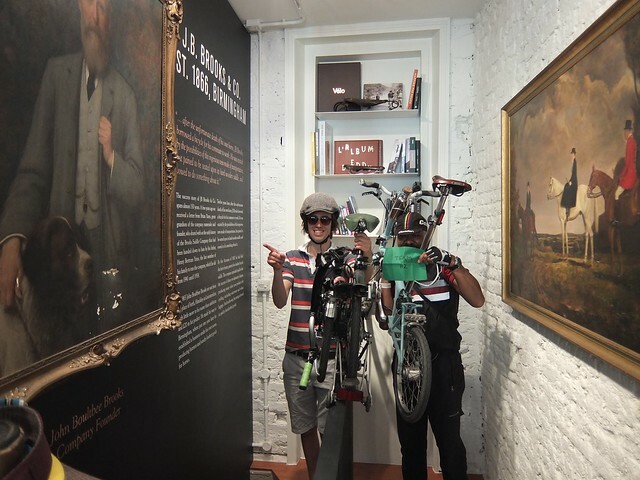 Overall the event was really good fun and I thank Brompton for putting it on! However, there could a few more improvements for next year - it might be good that for the start, perhaps it should be based on when you arrive and ready to go, your start time is recording and your finishing time is recorded as I felt that I’d turned up far to early. Whilst the atmosphere was nice, I felt that outside, I could have burnt before we even got going! Maybe my fault for seeing it said arrive early and everyone would set off at 11. However, that was probably my only real complaint of the day. Oh, and the glass bottles for the packed lunch - that was perhaps a disaster waiting to happen (in fact it was, as I saw one of the other teams arrive at the Science Museum and stop and the glass bottle fell out his bag.) Perhaps some plastic bottles next year Brompton? Perhaps not a long ride, but certainly an enjoyable ride.